New England Equine Medical & Surgical Center Field Services provides full service on-farm care of equine patients. Services provided by our Field Service veterinarians include but are not limited to preventative medicine services such as vaccinations and dentistry, wound management, lameness evaluation, pregnancy/breeding examination, and minor surgeries. 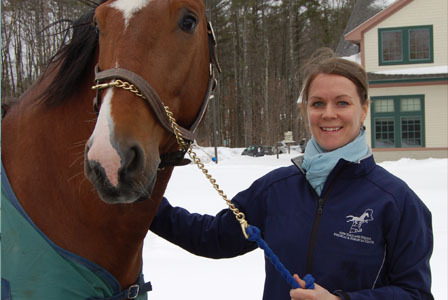 New England Equine Medical & Surgical Center offers clients and referring veterinarians extensive equine emergency and referral health care services in the hospital. We now offer extensive equine preventative and emergency services in the field. While delivering exceptional care to our equine patients we strive to provide compassion, education, and service to our clients. Patients requiring access to more advanced or specialized care can be referred to colleagues in the hospital. The veterinarians of New England Equine's Field Service will provide the highest quality primary care for your horse. Our mobile service emphasizes health maintenance procedures, but our clinicians are capable of addressing many equine health issues and conditions that occur in the field. We are available for scheduled appointments Monday-Friday and we provide emergency service 24 hours a day, 7 days a week. We offer full-service care and consultation services. Please call (603) 749-9112 with any questions about our services. 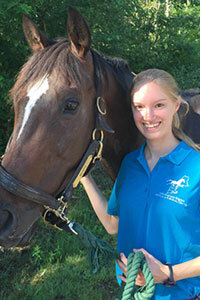 Kathy Samley, DVM, is one of our doctors that will visit you to take care of your horse. Katy Raynor, DVM an expert in your field. Annual/biannual veterinary evaluations are essential to the overall health of every horse. Our doctors strive to provide a complete and custom vaccination schedule for each individual equine companion based on travel plans and current disease threats to the equine species. Our office staff keeps meticulous medical records so you can be assured your horse is receiving the best possible care. Lameness is a problematic situation for horses and their owners. From a simple foot abscess to a complex ligament injury, lameness is a headache for everyone involved. Our doctors strive to insure the proper diagnosis of the lameness using diagnostic instruments such as radiographs and ultrasound as well as relying on collaboration with colleagues within the hospital. Our clinic is happy to walk you through each step of the reproductive process from ultrasound exams of the mare for ovulation and pregnancy to newborn foal exams and IgG tests. Our veterinarians perform castrations, laceration repair, and other minor surgeries in the field. At New England Equine Medical & Surgical Center, we understand that purchasing a new horse is a big step. We offer pre-purchase exams to help alleviate some of the stress that comes with buying a new horse. Our exams include a basic exam of the eyes, ears, heart, lungs, skin and teeth. Included in the PPE is an extensive soundness exam utilizing conformation assessment, flexion tests and gait analysis to pinpoint any possible lameness issues. For an additional fee, radiographs can be taken to further diagnose and evaluate lameness problems that may be seen during the exam. Most of our blood work is analyzed in-house with results in 24 hours. Some tests are sent to referral laboratories. For Coggins tests, we use Global Vet Link, an online system that provides fast turnaround for results and a professional, readable document with color photos of your horse. Your Coggins results can be emailed to you for easy accessibility. New England Equine offers the latest technology and equipment designed to promote a safe and rapid advancement for horses recovering from injuries. We give your horse every chance to make a successful return to competition by providing a variety of the most advanced and effective physical therapy options. Our skilled staff is thoroughly trained and knowledgeable, with a passion for horses and the desire to see your horse return well-rested, fit and ready to perform. With a portable shockwave unit, our veterinarians can provide improved healing times and a better prognosis for a variety of tendon, ligament and bone ailments that affect all types of performance horses. With different probes providing focused shockwave energy to a variety of tissue depths, we can more specifically treat superficial or deep tissues by increasing blood flow, increasing collagen strength and alignment or even decreasing chronic pain. We also offer rental of our therapeutic ultrasound machines for continued care at home.